Dairy manufacturing companies are very confident of their food safety systems against any risk of the 1080 threat but one has stepped up its security. Synlait Milk has brought in round the clock physical security checks for site access, including photo identification for all staff at its plant in central Canterbury. . .
A report suggesting business women need to get more assertive to arrest the dramatic fall in women around New Zealand board tables has been challenged by industry experts. Dairy Women’s Network (DWN) chief executive Zelda de Villiers acknowledged it was a challenge for women to get their feet under the table in the male-dominated agribusiness sector. . . This year, almost more than 10,000 tonnes of Otago apples will be traded in more than 60 countries around the world. 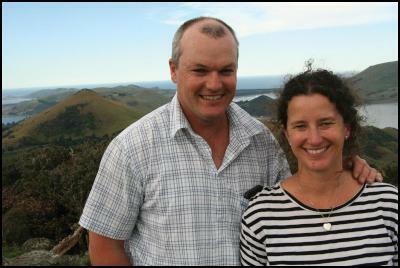 The apple industry has kept the van der Voort family in business in Central Otago for 50 years. Their Ettrick apple export packhouse is one of New Zealand’s largest. Reporter Lynda van Kempen follows some early season Cox’s Orange apples, as careful hands and high technology guide the way from picking and packing to trucking out. Collected from home, a quick bath, a spin through the packhouse and then chilling out on a leisurely sea cruise before meeting the fans overseas – that’s the lot of an Otago-grown export apple. . . The drought has put a dent in the incomes of South Island sheep and beef farmers, particularly those with lower beef cattle ratios. South Island prices at about $4.95 a kilogram for an average 17 kilogram lamb are back about 12 per cent from $5.55/kg the same time last year. A gap lies between southern returns and North Island prices of $5 to $5.10/kg. Lamb volumes have increased as farmers cull more stock during the drought through much of the South Island’s east coast. Volumes were up 11 per cent at 9.1 million lambs the middle of last month from 8.2 million the same time last year. . .
Half of the Alliance Group’s 5000 shareholders are women and the meat processor and exporter is strengthening its links with them to help them improve their decision-making on farms. A Nelson visit to a meat plant today followed a Christchurch workshop yesterday and a visit to Alliance’s Smithfield site in South Canterbury this week. The workshops were devised after it was noticed that women sometimes felt uncomfortable attending Alliance meetings and a pilot was held in Invercargill last year. . . Inspired by a European farming system, but with an understanding that New Zealand farms are different, a local engineer has developed New Zealand’s first purpose built calf feeding system. CalfSMART has the potential to reduce labour costs and lead to overall herd improvements. New Zealand has nearly 12,000 dairy herds that rear cohorts of calves ranging in size from less than 100 to over 250. The largest 15% of New Zealand’s dairy farms rear 35% of the entire country’s replacement heifers. Traditionally, calf rearing has been carried out by farming families, however in recent years as farms grow in size this work has increasingly been carried out by a migratory workforce. . .